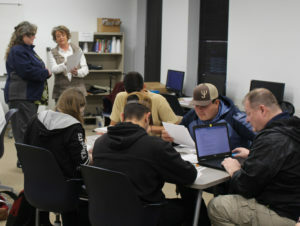 Professors Dr. Melissa Fulgham (left) and Anna Ingram (right) work with students during their history and English class. The two team-teach the courses in a unique hybrid format. Northeast Texas Community College has offered hybrid classes to help students get the most out of their time both on and off campus for several years. As more and more courses move toward a hybrid platform, there seems to be some confusion about what actually makes a class a hybrid. Jim Swann, Spanish professor and division chair for communications, said hybrid classes offer students the flexibility to build a schedule that allows them to be a full time student without having to be in class full time. Swann said, however, there seems to be a misunderstanding about the way some hybrid courses are designed and delivered. While some classes are held once a week, other hybrids still meet in the traditional twice a week setting. In short, a hybrid course replaces seat time with online activities but holds regular class meetings. Hybrids can be identified by the abbreviation “HY” next to the class name on the course schedule. It is important for students to note that not all hybrid courses follow the same structure. NTCC first started offering hybrid classes in 1990. Back then, hybrid simply meant part of the course was taught in the classroom while the other coursework was done in real world training. In 2000, the college began adding more online content to several of its courses. Today, hybrid courses can include anywhere from 25 to 75 percent of the coursework to be completed either online or face-to-face. Specific class requirements such as meeting times, lectures and the web components are subject to the course design as decided by individual professors and outlined in the course syllabi. History Professor Dr. Melissa Fulgham and Anna Ingram, dean of distance education, co-teach a history and English class that is different than the typical hybrid. While the class meets face to face twice weekly, the students receive both history and English instruction in a blended format. Students also engage in online activities such as quizzes, discussions and writing assignments. As the dean of Distance Education, Ingram serves as the administrator over the college’s online instruction including hybrid courses. “Some of our programs, like Funeral Services, [are] called hybrids, but they’re hybrid because they have some physical clinicals or aspects that they have to do face-to-face,” Ingram said. Rebecca Gardner, director of funeral service education, said students are able to utilize the online platform, which gives them more time to balance their school schedule along with personal and other obligations. Gardner said a majority of the funeral service coursework is completed online and then students come to campus for a week in their final semester and complete hands-on activities and some case analysis in person. “I like this format, personally, because when I was a student and I was a single mom, this allowed me the opportunity to go to school,” Gardner said. NTCC student Ariana Wimbly has taken multiple hybrid classes. She said while it took some time to get accustomed to the format, she has developed a liking for the hybrid structure. As hybrids gain in popularity among students, NTCC is looking to increase these types of blended courses. Ingram said there are currently 57 hybrid classes being offered this spring, with plans to add an additional 15 next fall. As students are given more options for hybrid classes, the most important thing for them to remember is to communicate with their instructors and make sure that they understand exactly what type of hybrid they are taking.